A new tourism experiment started in the past weeks to promote organic wines from Italy’s central region of Marche to the Uk market. The Bioculture project features a group of eight international artists wandering Marche’s countryside, to discover the heart of Italy’s organic wine-making district and promote the local wine industry on the British market through their work. The group has been walking for the past three weeks through the unspoiled hills of the central Italian region on the Adriatic Sea, visiting vineyards and wineries. The walk, the environment, the scenery and the wine inspired them in their artistic work. They will produce an e-book, about a new way of conceiving tourism in Marche’s rural areas. 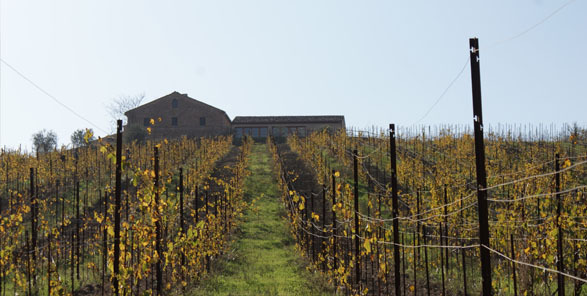 Behind the Bioculture – Arts Walks with Wine project is organic wine consortium Terroir Marche. Its aim is to draw attention on the reality of Marche’s organic and biodynamic wine-making practices, as well as to disseminate the culture and practices of a sustainable economy. The consortium members invoke small-scale agriculture in its multiple forms (whether it is a family business, a small cooperative or a small owner-farmed business), as the ideal reality where to craft distinctive products. The multimedia e-book, to be published in December, will be an original artistic travel guide designed to explore the innovative path that the artists themselves walked for the first time, following the ‘organic route’ of Marche through restaurants, farm-holiday homes and wineries involved in the project. The itinerary includes two Natural Parks, four Orange Banners, organic beekeeper co-operatives, green anise and saffron producers. During their 150 Km journey, which started on 30 August and is due to end tomorrow, 18 September, they had the chance to taste organic wines from wineries taking part in the project: “Aurora” and “Paolini & Stanford” (both in Offida), “La Distesa” and “La Marca di Michele” (in Cupramontana), “Pievalta” (Maiolati Spontini) and “Fiorano” from Cossignano. Bioculture – Artwalks is a project of Sineglossa Creative Ground, Tonidigrigio, PepeLab and is co-financed by the Marche Region, Youth Policies Department and by the Italian Presidency of the Council of Ministers.